Whoa. That is the most direct and natural reaction to what happened last night, on the evening on day 4 at the closing of the Original Cultures pilot. Whoa. The live showcase, the crowning of the 4 days of work for the artists and the cherry on top of the pilot if you will, the event where the public gets to see everything that we’ve all worked on for so long, was a success – and as an organiser this isn’t a boast, it really, truly was. We got to the venue around lunch – the musicians soundchecked in the PM while the visual artists put the finishing touches to their creations and masterminded how the visuals would play out throughout the night. Things were going well, with the necessary high level of running around involved when you put together an event. 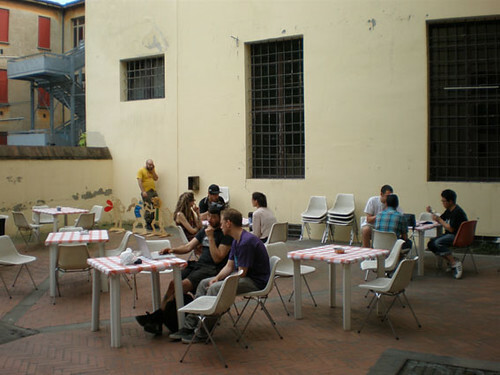 And then as we approached opening time, the decision was made to cancel the live painting aperitivo due to technical issues – partly true, but also due to the fact that the visual artists actually stopped working as people entered the venue. Having been at it for 5 days non stop, there was no way we would force anyone to do something just because it was originally written in the programme. With this in mind we opened and hoped for the best. People came looking for the live painting and decided to maybe come back when they learnt it wasn’t happening. Others came in regardless, curiously looking around the venue, trying to understand what was going to happen 4 hours later. As I stood in the courtyard next to the bar, DJing, I kept thinking to myself that maybe even without the live painting we’d still manage to bring enough people in. 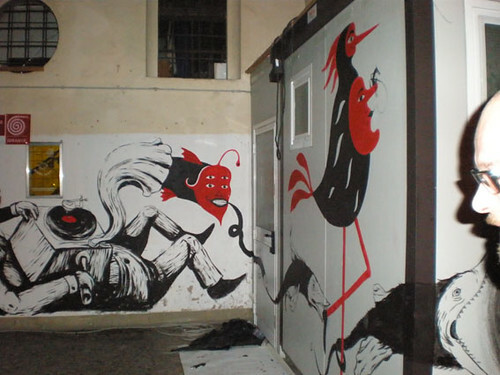 You see the thing is, the whole live painting is quite popular here in Bologna, and the visual artists were definitely one of the main attractions of the project for people in the area, mainly because Ericailcane and DEM are local artists who everybody knows. Losing the live painting meant we might well lose a big amount of people. As I tried to not think about it too much, considering that we knew we still had something incredible prepared but that we couldn’t really tell people without giving the game away, I got on with trying to make people drink and enjoy themselves as the evening rolled on. And then I looked up, around 8 or so and Will was walking around with a tub of paint… and that’s when it all started going crazy. DEM, Ericailcane and Will painted from 8 till 10, as they did people flocked to the venue, by the time I finished the DJ set in the courtyard, the venue was nearly full and I could barely believe it. The show started with the first hour split between Tatsuki and 2tall/Om Unit doing solo shows of about 30mins and the second hour with Tayone, Bruno and the two of them doing the live show they’d spent the last 3 days creating. As I stood there looking at Tatsuki on the stage playing to the audience a piece he’d finished writing 2 hours before it started to hit me just how special this all was. The stage was set in the center of the room, so that people could stand all around the musicians. On the walls projections made by the visual artists played using Chinese shadow concepts. And on one side a giant screen played elements from an animation that they also created during the week. Tatsuki for his part ditched the entire 30 mins set he’d originally prepared and instead played a beautifully atmospheric 20 or so mins using sounds he’d recorded the day before and inspired by the visuals created by DEM, Will and Ericailcane: us talking, him speaking Italian, the ticks from the clock of one of the guys who runs the venue… it was incredible to hear all these sounds which I knew were ‘ours’ coming together while people stood around trying to understand what was happening. It was the perfect way to start. And then the final hour started and it continued to be incredible – the three of them played as if they’d known each other all their lives. The audience went crazy, the vibe was unbelievable. 10 mins before the end we were turning people away by the tens, and wondering how the hell it had all happened. Everywhere I looked people were smiling, dancing and enjoying themselves. The visual artists were more happy than I’ve seen them all week and so were the musicians. Fast forward two hours, and we’re all sitting around coming down from the adrenaline rush and thinking back to various elements of the night. Everyone, from the artists to the organisers, the technical crew to the film crew was on a high. And everyone was responsible for the beautiful event that took place last night – everyone worked for nothing more than the want to do this, we came together as a whole in the most organic manner. And to me, as the person who had this idea, who brought this idea to this town nearly 1 year ago to get some advice, to see the idea turn into reality like this (pretty much one year to the day since I first came up with it) is just simply incredible – tears came to me early on in the night and by the end I was just floating on a cloud, words unable to do justice to the feeling of seeing this idea birthed into reality. To know that every single person involved also felt the same is the best reward ever. We’ve worked on this for 6 months solid, plus 6 months before of masterminding, and one week of just working non stop – and there has never been a point in all that time where someone argued or something went truly ‘wrong’. And that’s something I can’t even begin to comprehend. It gives me incredible faith that what we are building, is something that will continue to grow organically and that will hopefully be enjoyed by more and more people in the future. For now, the best brunch in Bologna awaits me. HD video teasers of day 3 and 4 will be online by tomorrow. And full reports from the editors and artists too. And then stay tuned as we start to roll out the documentation of the project starting this month until the end of the summer. To everyone who came last night, thank you. To everyone who took part in this, bless you.